I wrote this article about my first CD, VOYAGE, several years ago when CDs were the preferred method of distributing music. Times have changed, and music is now streamed by online vendors, such as Spotify and Pandora, among others. Often, when initial runs of CDs sell out, record companies will go the online route exclusively, for reasons of practicality – manufacturing cost, storage, shipping, and distribution. VOYAGE has now gone the streamline route. However, despite these changing times, many of my comments are still relevant and may be helpful to anyone planning a professional recording. I hope you find my story useful as you share your music with the world. Here are my experiences recording VOYAGE, a CD of beautiful music from around the world for flute, string quartet, harp, and bass. When I began my recording project, friends said, “Don, it’s great that you’re recording an album. What record company will put it out? Who’s going to manufacture it?” I had to cover my ears! While I’m sure my friends meant well, I had to say, “Hold on, I can’t think that far ahead. I can only think as far as the recording date. To plan any farther will prevent me from starting the project at all.” This was the truth. I had never recorded a CD before for that very reason. For me, it would have been too daunting a project unless I took it one step at a time. I had all the usual urges for recording a CD. I mean, why work all your life at being your flutistic best and not leave something behind to show for your efforts? But I didn’t want my first public recording to be just another rendition of the Poulenc or Bach Sonatas. Who would buy such a CD? I’m not famous – the buying public would certainly choose Galway’s or Rampal’s versions over mine. So, instead of cloning old ideas, I decided to make my CD fresh and new. I also wanted make a contribution to the repertoire by creating some new orchestrations. Better get ready, this won’t be cheap! Since this was my first CD, it was up to me to provide the funding. I suppose there are ways to get support, but I didn’t know of them. I set up a budget, designed a spreadsheet, and tallied the cost of everything related to the project. I included fees for music, arrangements, recording engineer, producers, musicians, recording space, mechanical licenses, attending staff, travel, cartage, editing, mastering, production, graphic design, printing, manufacturing, mailing, and the list went on and on. I gathered music, musicians, the recording engineer and producers, located a recording space, and followed a timeline to allow for rehearsal and preparation. I also started reading about copyright laws. It’s important to research the dates of the compositions to determine what’s in the public domain and what’s not. There are licensing fees to be paid for recording copyrighted music. This is so important! Initially, I hired a newly formed string quartet made up of very good freelance players. They were affordable because the CD would have enhanced their efforts as well as mine. Unfortunately, and despite their good intentions and superior playing skills, this quartet was unable to meet the rehearsal/preparation demands due to their busy freelance schedules. I had far too much at stake to take any type of risk, so I “disengaged” the freelancers and hired the Arcata String Quartet. The Arcata is a professional quartet with management. They rehearse on a regular basis and have keen ensemble skills. Of course they were more expensive, but the advantages were clear. Experience told me to draft an Agreement for everyone to sign. I included any and everything that I considered important – fees, cartage, allotment of rehearsal days/hours, performance dates, musical expectations, royalty distribution, cancellation options, complimentary CDs, reorders at what price, bios, photos, etc. While it was intended to be a collaborative effort, I maintained artistic control over musical interpretation, selection of takes for edits, cover design, manufacture, distribution, etc. This is as important as choosing great musicians. I found an engineer with experience and a reputation for recording flute and strings, and I listened to samples of her work. We both visited the recording site in advance to test the sound and to determine what “props” would be needed to correct any acoustical imperfections. Again, I put the terms of our agreement in writing: the recording fee, including cost of setup, whether additional technicians would be required and at what rate, the start and end times of the recording sessions, allowing time for her to set up in advance. The Agreement included travel arrangements to and from the site and expectations of editing, mastering, ownership, completion dates, etc. I have learned that billing “by the hour” can really get out of hand. Whenever possible, I tried to settle on a fixed price for particular segments of the project – all in writing, of course. Unfortunately, I could not get my engineer to put the editing phase in writing, even though we had verbally agreed on the terms. Well, later I understood her reluctance to sign. I was forced to pull the job from her midstream and hire someone else to finish the project. This delayed the release date and increased the cost of the recording. Some people don’t hesitate to record in a studio, but I don’t like it – too dead! Plus, I can hear those little electronic tricks they play to make it sound like a hall. However, acoustic spaces are at such a premium in Manhattan that you may have to travel, which will add considerably to the cost of the project. Don’t be fooled by the beauty and ambience of a space where you’ve played a recital. Noise is a key issue in a recording session – outside noise, air conditioning noise, electrical noise from lights, rheostats, refrigerators, elevators, subways, cars, sirens, children, etc. ad infinitum. If you weren’t aware before the recording that New York is a noisy city, you’ll be ever so enlightened afterwards! Interference from noise adds hours to your sessions and dollars to your edits, BUT there’s nothing better than playing in a really great acoustic space when conditions are right! This is a pretty loose term used in many ways. I had two producers on hand – one string player and one flutist. These key people held the scores and made sure that all the notes were accounted for. They also listened for outside noise, bow clicks, cracked flute notes (yes, there was one…okay, maybe two). Skilled producers help pace the sessions so that valuable time is not wasted. In addition to pointing out the negatives, they also encourage you to move ahead when you’re convinced you just exposed yourself as a flute fraud. Objectivity goes a long way in getting a CD out the door. What a lovely dream it would be to record a CD involving seven musicians over a period of three days without making a single mistake! Well, a dream it is. A non-musician friend once asked me how the CD was going, and I said it was in the editing stage. He said, “Isn’t that cheating?” Well, this was one of those AHA’s you run into occasionally, and it took me a minute to respond. I suppose there’s a hint of truth there, but if you think about all the variables in a 3-day recording session: noise, coughs, sneezes, water in the pads, foot taps, swollen lips (Yes, on day two my bottom lip was visibly swollen for some still unknown reason), it’s just impossible to get it right in one take with so many players involved. Find an experienced editor and nail down his/her price. Most charge by the hour, but if at all possible, request a fixed fee for the entire project. Even the highest level recording artists are now asking for set fees so that there are no overages. Unless you intend to sit with the editor and listen to all the takes together, which will cost you two million dollars, YOU will be the person selecting the takes. I suggest burning (that’s the tech word for saving files onto cds) CDs of all the session takes and using software that allows you to line them all up for direct comparison. This is a painstaking process that will take days, weeks, and maybe months to complete. I’ll say this about the editing process: my listening skills improved enormously! By the end of the project, I knew everything about everybody’s playing, and there wasn’t a note in the score that I hadn’t heard and understood the importance of. Anybody need a chamber music coach? As I got closer to the finished product, I contacted record companies with the hope that someone would take over the process and handle the manufacturing, marketing, and distribution. I even manufactured a supply of CDs with only 23 minutes of music to send out as demos. I suppose it was a noble effort, but looking back, I think I was probably delusional. It would be unlikely that a label would take on such a project with an unknown artist, even though the demo was really well done. Most editors will be able to master your CD. Mastering, in very basic terms, involves optimizing the frequencies of the recorded sound. For example, you might want to enhance the balance a bit, optimize, compress, add ambient sound (reverb), etc. I chose to go with the original sound of the concert hall, but we did play a bit to improve the balance of the ensemble. If you have a good engineer, as I did, you will have very little, if any, mastering to do. I also worked with a good editor (Marco Granados) who used the latest software to add analog qualities back to the digital recording. Since none of the record companies responded to my demos, it was up to me to manufacture VOYAGE. To save money, I personally researched and wrote the program notes and designed the booklet, tray card, and marketing materials myself. (Ever learn PageMaker in a week?) I delivered this on a disk to the manufacturer. My editor produced a mastered, edited, ready-to-go CD-R with a printed Cue Sheet (track, timing codes). I requested a UPC bar code from the manufacturer so that I could sell VOYAGE in retail outlets. While the final product was very good, I had to monitor the manufacturing process closely, as my standards after a yearlong, very costly project were obviously quite high! The manufacturer dropped the ball in several areas, and my booklet had to be reprinted for a number of reasons. The completion date was off by about three weeks. It’s funny, it took about 15 months to get my project to the manufactured stage. I thought the hard part was over. Wrong! One thousand beautifully shrink-wrapped CDs sitting in my apartment was doing no one any good, and I certainly wasn’t recovering any of my costs by letting them sit there. But how does a lonely, exhausted, financially drained, pathetically pitiful person distribute a thousand CDs all by himself? I mailed out freebies to radio stations and anyone who I thought could help me. I contacted businesses that I knew carried CDs (Flute World, Juilliard Bookstore…. ), and I tried once again to make an impression with the record companies hoping to get picked up. I learned quickly that the recording industry is very complex (just try to research the labels that Polygram alone owns!). One company may own numerous others, and you have no idea where your demo ends up, nor do you have any control over the speed of the audition process. Fortunately, the Internet now provides an outlet to help independent unsigned artists distribute their recordings. My manufacturer provided a free website (http://donbailey.iuma.com, no longer active) where visitors could hear samples, send me email, post comments, and buy the recording online. I also found a second site (http://theorchard.com, also no longer active) that linked to CDNow.com and Amazon.com where VOYAGE was sold. Cyber selling worked well for me, and I think it just might alter the future of the recording industry. 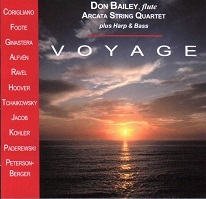 Some good news to share: I released VOYAGE on my own label February 6, 1999. On March 17, 1999, just a few weeks later, I signed with Summit Records, who repackaged VOYAGE to market and distribute worldwide in July 1999. Summit allowed me to continue selling my release of VOYAGE over the Internet, but I had to avoid selling it in markets that Allegro, Summit’s distributor, supplies. Signing with a label is obviously a happy ending to a long labor of love and angst. But my instincts for careful i-dotting prevented me from cavalierly signing on a dotted line. I asked friends for contacts in the legal industry to help me review the contract. It was Nadine Asin, piccoloist at the Met, who connected me with an attorney who not only specialized in the entertainment industry, but who was by coincidence also a former concert pianist. While we made only a few changes to the original contract, the legal fee was well worth the peace of mind I got from having everything looked over. I might also advise that one shouldn’t rest too much on his/her laurels after signing a record contract. Remember, no one has your interests at heart more than you. I recommend keeping in touch with your record company and letting them know your comings and goings, your contacts, concerts, etc. I think it’s good to build an ongoing relationship with them, rather than trusting them to know what’s best in all cases. I asked Summit what made my CD rise to the top of their list of auditioning artists. Their answer: VOYAGE was “fresh and new.” My concept paid off! 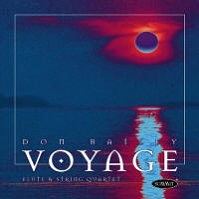 Since VOYAGE’S release on the Summit label, it has received favorable reviews in Fanfare and American Record Guide magazines. I often receive emails from people around the country, Boston, San Francisco, Dallas, and Chicago especially, who have heard Voyage on their classical radio stations. Boston’s WGBH offered it as a premium during a recent pledge drive. That was cool! Tracks from Voyage and Tribute (flute/piano) are now available for download on the many streaming web apps – Spotify, Pandora, among others.